A regional publisher’s headquarters could be demolished and the site used for apartments and office space if a proposal is backed by planning chiefs. A blueprint for the possible redevelopment of Archant’s Prospect House HQ, in Norwich, will be examined by Norwich City Council’s planning committee following a public consultation which ended on Friday. Archant revealed last year it was planning to sell Prospect House, which is the home of the Eastern Daily Press and Norwich Evening News, with the intention of relocating to a new base in Norwich city centre. 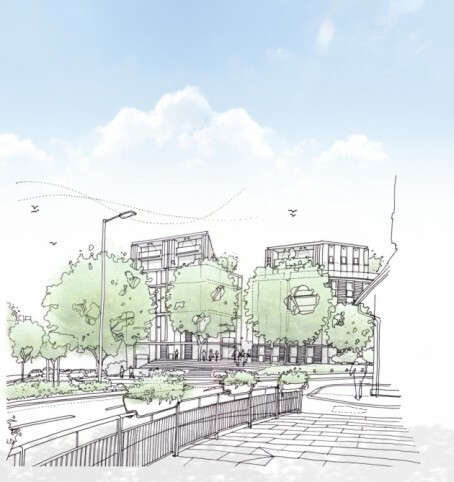 A development brief document outlining the plans will now be submitted to the committee and, if approved, will be used to guide any planning applications lodged for the site. The planning document envisages that Prospect House, which was opened in 1970, will be demolished under any plans. In an update to shareholders, which has been seen by HTFP, Archant chairman Simon Bax said the company did not intend to develop the site itself and will be looking to sell in 2019. In the update, Simon also told shareholders the company remains “on track with our plans, despite some testing market forces” and added its digital operation had been a “success story”. He said: “With almost three-quarters of our views now on mobile devices, digital audiences have increased year on year by 3pc which was made up of 9pc growth in the first quarter and a 6pc fall in the second quarter following a change in a Facebook algorithm which reduced the priority it gives to news stories, meaning fewer click-throughs coming from that source. Quoting a staff survey produced in March which showed 91pc of Archant’s workforce “were prepared to go the extra mile for the company” and 85pc “said they enjoyed coming to work”, Simon added a small pay rise had been implemented in order to address concerns addressed around pay and reward. He concluded: “The outlook for the rest of the year looks challenging, but with targets that are achievable. We have some cost increases to come in the second half of the year, particularly with newsprint, our second largest cost, where we are facing a perfect storm of restricted supply and adverse currency exchange rates causing prices to rise. Having seen the report two things stick out for me, with the sake of the HQ building planned for next year what are the plans for those staff currently working there? We’ve heard all about the site itself but nothing about the location of staff once sold. Secondly with all eggs being put on the digital basket following a minimal increase yoy it would appear that the company has further removed itself from investing in its failing print papers which at the current rate of sales and ad revenue decline must put some in the seriously at risk category,allowing some of the weak weekly titles to drag incurring costs rather than going free or digital edition only seems foolhardy when the money could be better spent elsewhere. It was also hunourliud how any reference to not paying a shareholders dividend yet again was included in one sentence right at the end. With the large increase in print costs I would imagine they will finally stop producing some of the least profitable free titles. Amoung the larger publishers they have held on in there for a quite a while and only reduced print runs but I could imagine a few will have to go shortly especially in Cambs. Those staff survey results are *very* different to what employees who work there say. My prediction: small city-centre base for reporters and key sales staff; everyone else packed off to the printworks at Thorpe St Andrew as I’m sure they can put up a few shed-type buildings around there. Also much cheaper than the centre of Norwich. Titles like Dunmow, Saffron reporter and Royston Crow are highly likely to be at risk for cuts or ceasing. They along with the Herts titles have already had a cut in circulation in the last 18 months. Judging by the name I’m guessing you’re more thinking about the Cambs and Wisbech Titles. Bearing in mind none of these titles have much leaflet coverage and a heavy outlay of staffing cost for delivery as well as management cost paid to Whistl while also having paginations of 64 or less it’s highly likely that increased print costs could make them unprofitable as they’re likely barely managing it now if at all. I am thinking along similar lines,the print centre has ample provision for additional staff and could easily accommodate the ones who need an office base; designers,telesales,key editorial functions etc I also feel more use will be made of remote working via laptop and mobiles for the district staff primarily the ad sales reps who’s role by its nature shoyldcsee then out of the office and on patch.